photo of the outside of the Whispering Canyon Cafe. Photo courtesy of Disney. Disney’s dining website promotes The Whispering Canyon Cafe as “a rowdy, rootin’ tootin’ good time, round up for the whole family for hearty western fare and antics aplenty.” I’ll be honest, after an entire day in the Magic Kingdom, I wasn’t sure I was ready for “rowdy or rootin’ tootin’.” But, I was ready for dinner and their menu offers the following on their All-You-Care-To-Eat family style dinner buffet: Kansas City-style Smoked Pork Ribs, Barbecue Pulled Pork, Herb-baked Chicken, Hand-carved Oak-roasted Beef Strip Loin, Citrus-crusted Market Fish, or Western-style Sausage. Sides included: Seasonal Farm Fresh Vegetables, Herb-crushed Yukon Gold Potatoes, Cowboy-style Baked Beans, and Corn on the Cob. My nine year old daughter and I are both picky eaters, but this menu had food we both enjoy, so we decided to go for it. Plus, we were spending the day in the Magic Kingdom, so it wasn’t too far from the park. 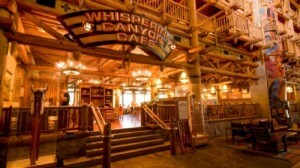 It’s located in the Disney Wilderness Lodge Resort. Once we started looking at the menu, it didn’t take my daughter a long time to notice the bottomless milkshake beverage option. The Whispering Canyon Cafe had already won her over. Luckily we were seated by the fireplace, because after her second shake (don’t judge, we were on vacation), they turned it on for us because she was cold (in Florida, in the middle of August). Our food arrived and my first thought was, “there is no way we are eating all of this.” Our table was full of food and we didn’t know where to start first. However, if I thought our table was full then, it was about to become overloaded … because my daughter asked for KETCHUP. If you’ve never eaten at The Whispering Canyon Cafe, this was our first time, you should know that you have to stand up and shout “I need ketchup.” Then, everyone who has ketchup brings the bottles to your table. You are then stuck with the ketchup until another unfortunate soul stands up and yells for the condiment. We had between 20 – 30 bottles of ketchup at our table. When the next person shouted for ketchup, we enlisted the help of our neighboring tables to bring it all to them. It really was “a rowdy, rootin’ tootin” good time. After dinner our dessert option was chocolate cake or cheesecake. I thought it was an either/or option. Nope! They brought both. I don’t think we were able to eat all the dessert. We were too full. We went back to the Magic Kingdom (mostly just to walk off the dinner we just ate), and enjoyed the rest of the evening there. On our way back to the resort, my daughter wasn’t talking about Splash Mountain, Space Mountain, or the Haunted Mansion which we rode about five times each. She was still talking and laughing about all the ketchup that was at our table. A “rowdy, rootin tootin’ good time” indeed. Bryan lives in Pittsburgh, but thinks of Disney as his second home. His daughter loves going to Walt Disney World and his son will be making his first trip soon. Bryan's wife prefers the Disney Cruise (more specifically the spa) to the fast rides at the parks, but they love each other anyway.